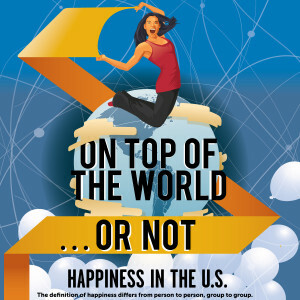 With a relatively high standard of living, Americans generally are happier than those in other countries around the world. But what does that really mean? What are they happiest, or unhappiest, about? A recent Gallup poll measured Americans’ feelings about their own lives in five categories. (1) For each category, people fit into one of three groups: suffering (low and inconsistent well-being), struggling (moderate and inconsistent well-being) or thriving (strong and consistent well-being). While most of us aren’t suffering, we aren’t thriving, either. With just one-third of Americans saying they’re very happy, what factors might be contributing to our moodiness? So how do Americans stack up against people in other countries? As you might expect, we’re not the happiest, but we’re not the most miserable either. According to a United Nations analysis of national sentiment, the happiest people in the world live in Denmark, Norway, Finland and the Netherlands. The least happy? Those factors and others were combined to determine each country’s life satisfaction score, on a scale of 1-10.